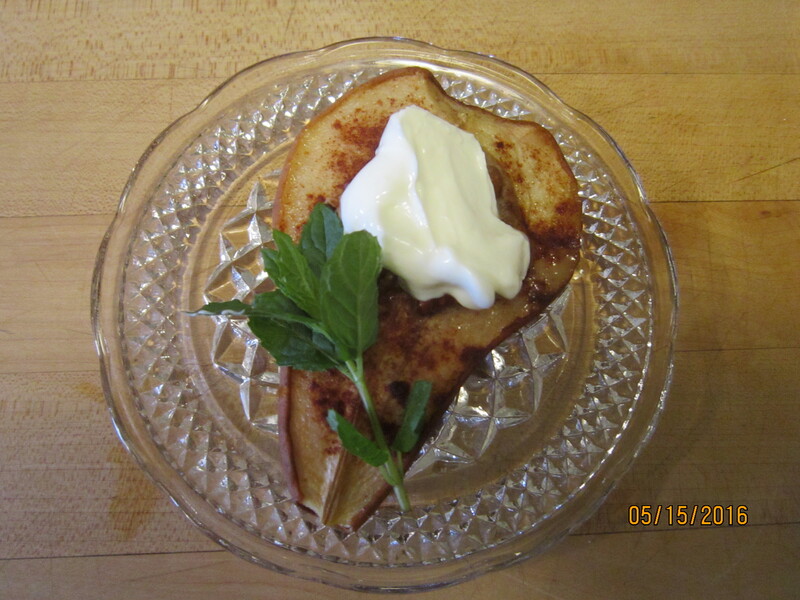 These yummy baked pears were part of the breakfast offering on Sunday morning! Amazingly simple to make, they are the newest addition to our breakfast family. It’s only minutes from the beginning to the oven. Cut a whole pear in half lengthwise and scoop out the seeds. Sprinkle with cinnamon and drizzle with honey. Add some butter to the seed hollow, then sprinkle with pecans or walnuts. 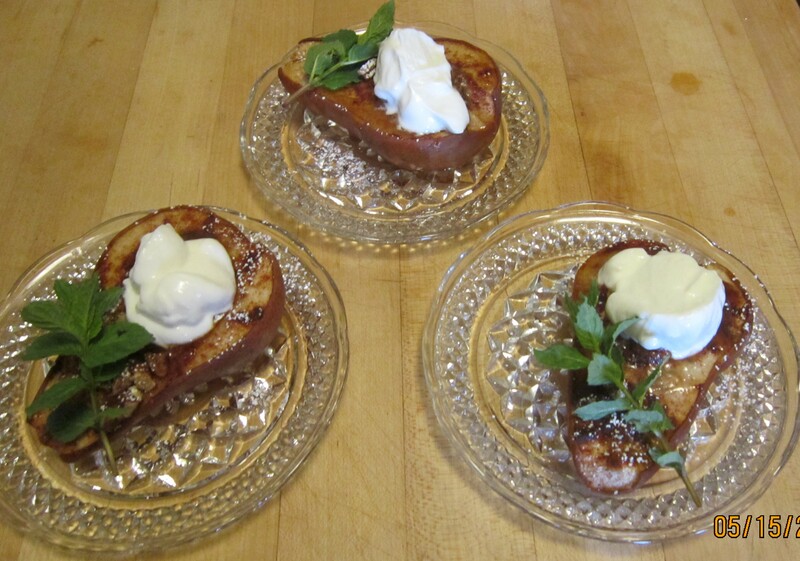 Bake for 50 minutes at 350 degrees, add a dollop of plain yogurt–and pre-pear to be delighted!! It was a perfect Indian Summer day yesterday at the Carriage House Inn and Sodus Point. It was hard to believe it was November 4 with clear sunny skies and the thermometer at 73 degrees. 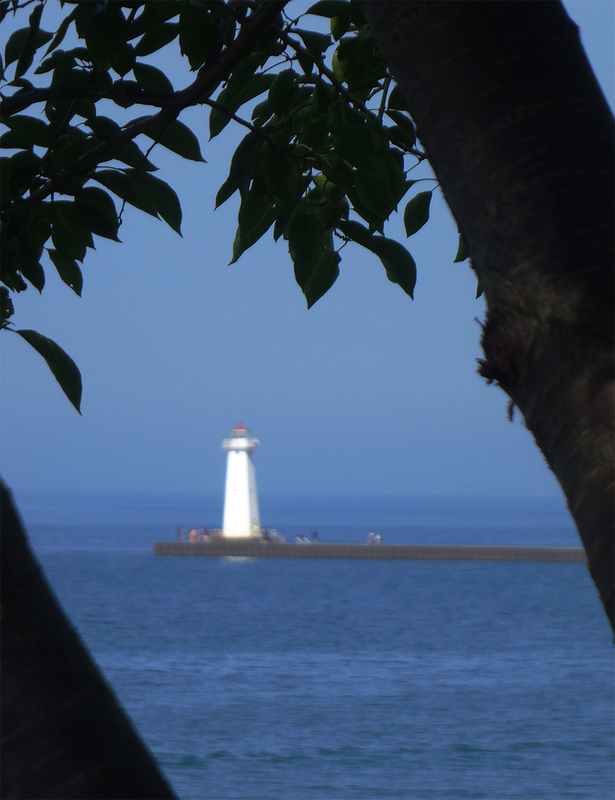 The silvery waters of Lake Ontario lived up to its Iroquois Indian name: “Sodus”, capturing this lovely reflection of the lighthouse in the waters of the lake. At the Inn, we are busy getting the grounds ready for winter–herding leaves into large piles, putting away outdooor furniture until spring, closing down flower and vegaetable gardens, and moving the herb garden inside to season our breakfast dishes all winter long. 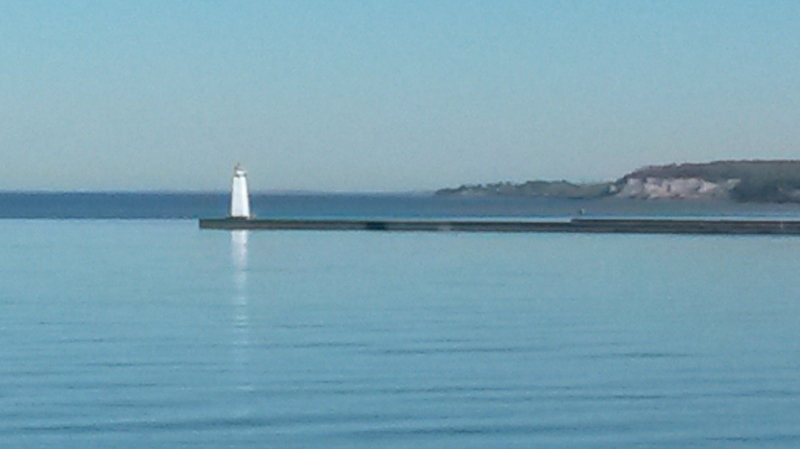 Just a reminder that we will are open all year, and Sodus Point is a great area to visit in every season. We look forward to seeing you at the Point! 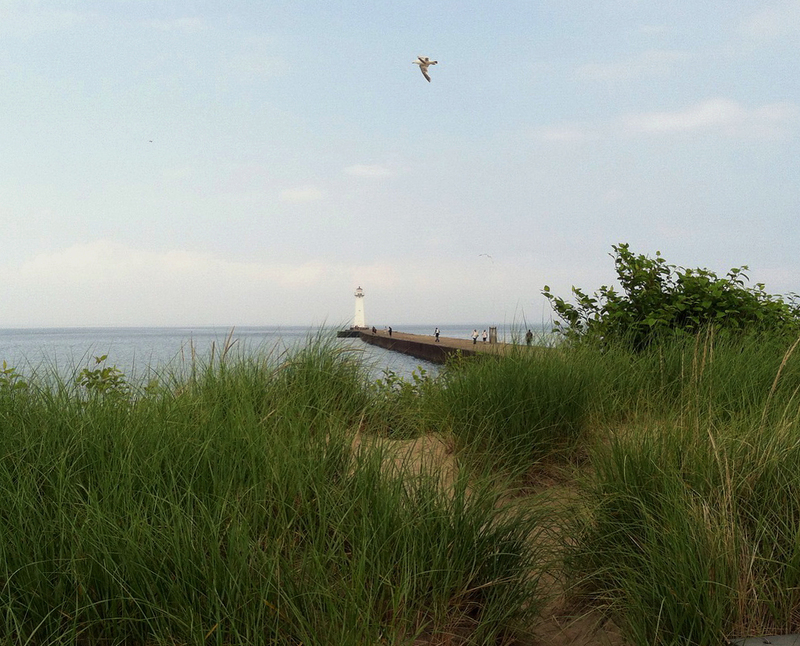 We made a brief stop at Sodus Point Park yesterday afternoon, and the view was spectacular! After the storms that went through the area the previous evening, the skies were an unbelievable blue, with fluffy white clouds, and a freshening breeze made the waves on the lake as ocean-like as I’ve seen in a long time. The maintenance crew was hard at work clearing the parking lot of the sand that had blown up during the storm. There were not too many brave souls out on the beach on this breezy day, but on days like this the Point has a beauty all its own. 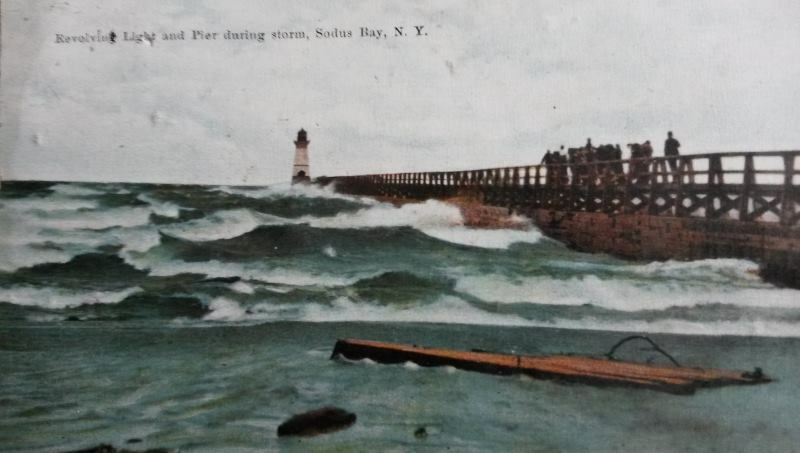 We found this old postcard of the Sodus Bay Lighthouse at an antique store in Geneva, NY . It shows the old wooden pier to the lighthouse, with a catwalk above the pier. We are guessing this postcard is circa 1930…..does anyone know more about the wooden pier era? 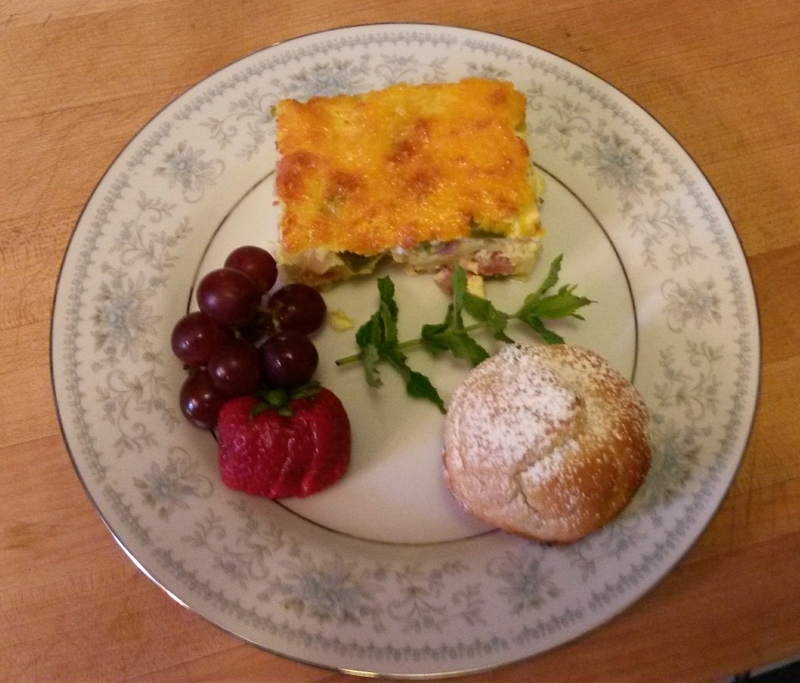 Here is a much requested recipe of one of our popular egg casseroles!! Melt butter, and lightly saute’ onion and peppers. Add diced ham and thawed potatoee, stir to mix. Bake at 350 degrees for one hour, or until knife comes out clean when inserted. As a new poster to the View From the Point blog, I should probably introduce myself. 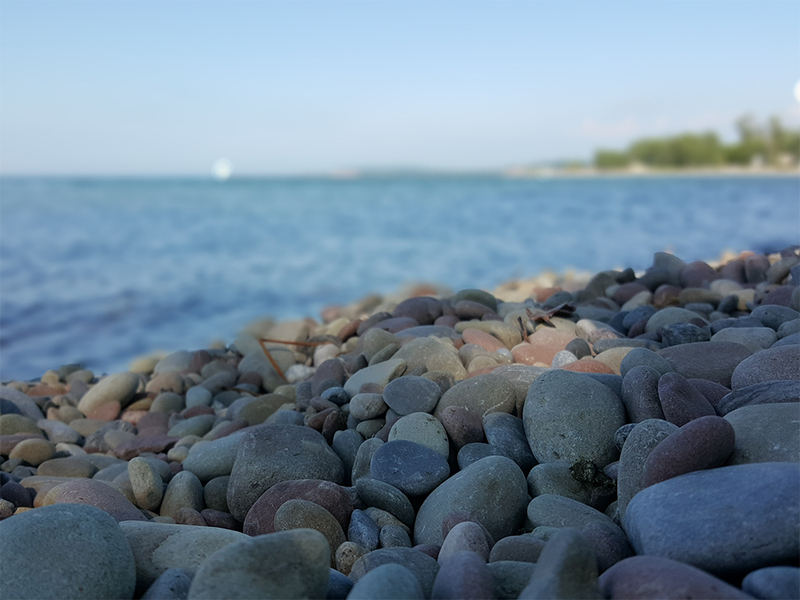 I live in the Finger Lakes region of New York, and for that reason I’m fortunate enough to be able to visit Sodus Point quite frequently on day trips, although on occasion some of our out-of-town visitors have been guests of the Carriage House Inn. Jerry and Claudine have given me permission to post on their blog occasionally from a visitor’s point of view. 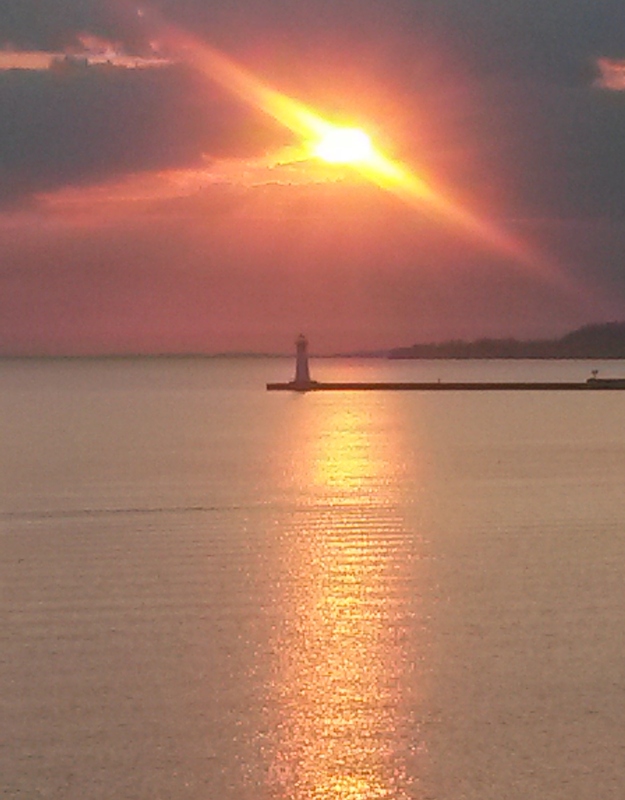 As a habitué of the area, I have come to appreciate that every season in Sodus Point has its own charm and beauty. The crisp brightly-colored leaves crunching underfoot in the fall, the solidified frozen “waves” that stand like apparitions against the breakwater in the winter, and the tulips and lilacs that bloom in the spring are all beautiful in their own way. 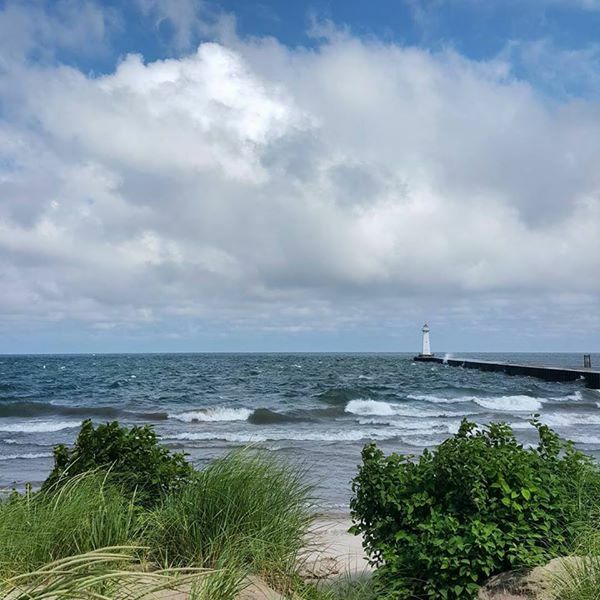 Yes, Sodus Point is a destination that should never be overlooked when visiting Lake Ontario, regardless of the season. 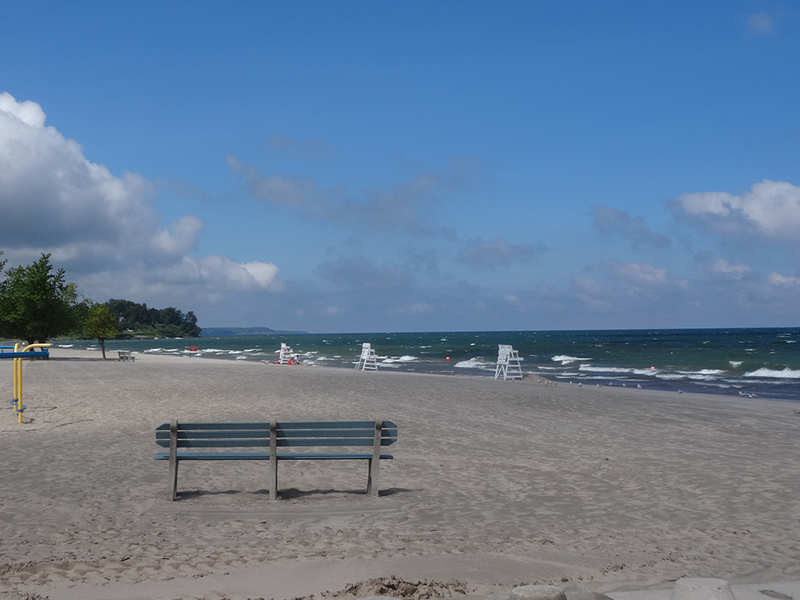 That being said, Sodus Point probably gets the most visitors during the summer months, when the outdoor water activities at the local parks and beaches can be enjoyed to the full. This past Sunday my family and I had the opportunity to visit the Point with friends from nearby Cortland. The weather forecast that morning didn’t look very promising – scattered thunderstorms all afternoon, just when we would be wanting to walk around the Point and see the sights. But knowing the capricious nature of Lake Ontario weather, we decided to go ahead with our plans in spite of the forecast. Key Lime Pie, Salted Caramel Vanilla Crunch Cake, and Chocolate Hazelnut Cheesecake. They were all delicious. 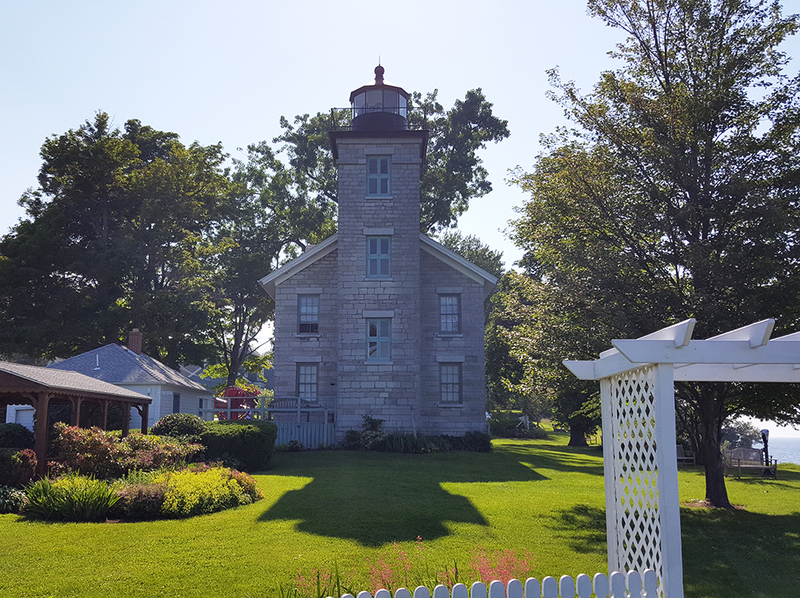 From there we drove over to the Sodus Bay Lighthouse & Museum, which is just a stone’s throw from the Carriage House Inn. The grounds around the Lighthouse are always a favorite spot, and this visit was no exception. We took a leisurely stroll, enjoying the sights on the well manicured grounds, and headed down the back, past the pavilion where the free Sunday concerts are held (which will begin July 4 weekend), through the arbor, and down toward the rocky beach. 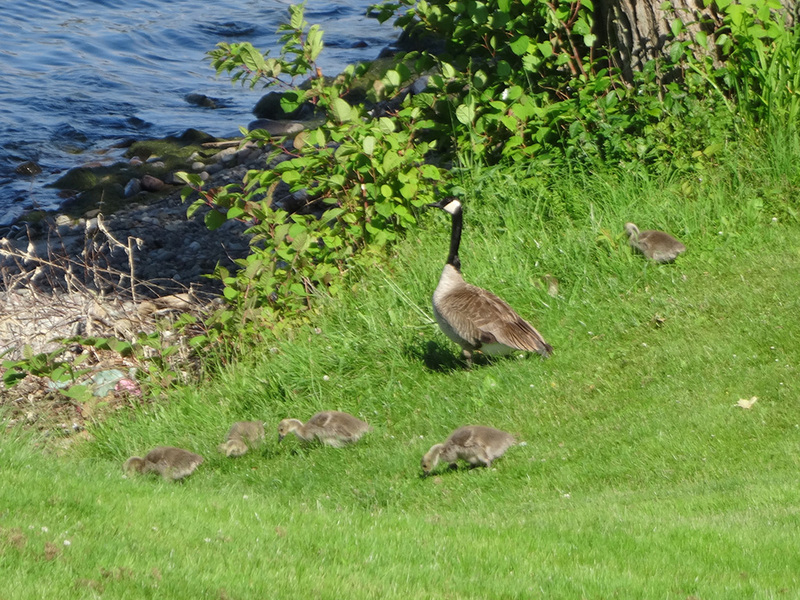 As we approached we saw a family of geese on the lawn, close to the edge of the beach. We watched them for a while, and they started heading toward the water. 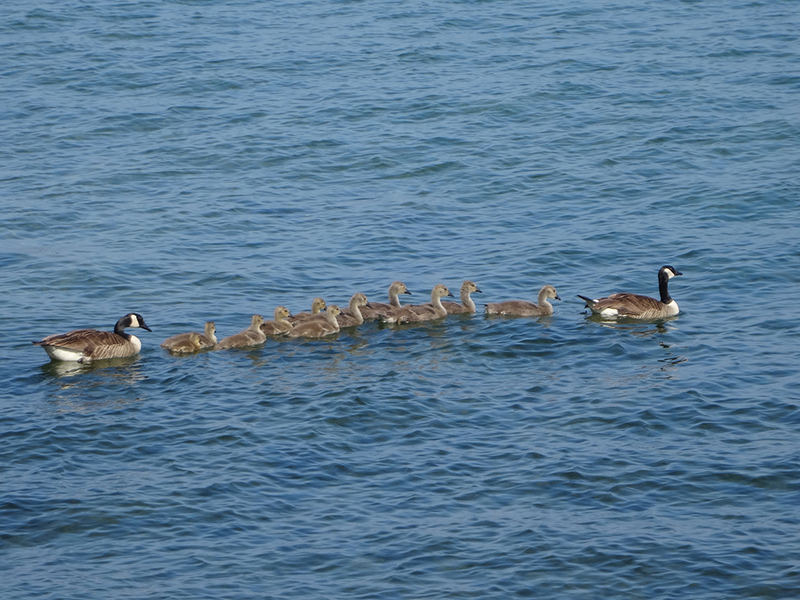 We followed behind and found a nice log to sit on at the edge of the water, and watched the little family swimming along, following the shoreline east toward the sandy beach of the Park. We sat there for the longest time, just drinking in the beautiful weather and the quiet lapping of the water on the rocky beach. Too soon it was time to leave and head home, but we had enjoyed a perfect summer afternoon in Sodus Point. 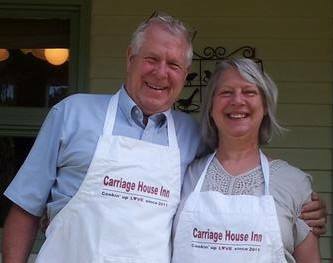 Jerry and Claudine warmly invite you to join them at the Carriage House Inn to enjoy the beauty of the area, and partake of the many activities offered, or just to sit and drink in the quiet beauty of their little corner of Sodus Point. Lilacs and Lighthouses is a good description of Sodus Point this week. The Point is in bloom, and this view of the lighthouse framed by lilacs on the left and Chimney Bluffs on the right is absolutely beautiful. This shot was taken from the bluffs at the Lighthouse Museum, just a few hundred feet from the Inn. And we’re blooming at the Carriage House Inn, too! We’re planting, pruning, mowing, and enjoying the warm spring days and cool nights. The fragrance of the season is wafting through the Inn, augmented by the occasional aroma of chocolate chip cookies in the oven. Ready for a change of pace? 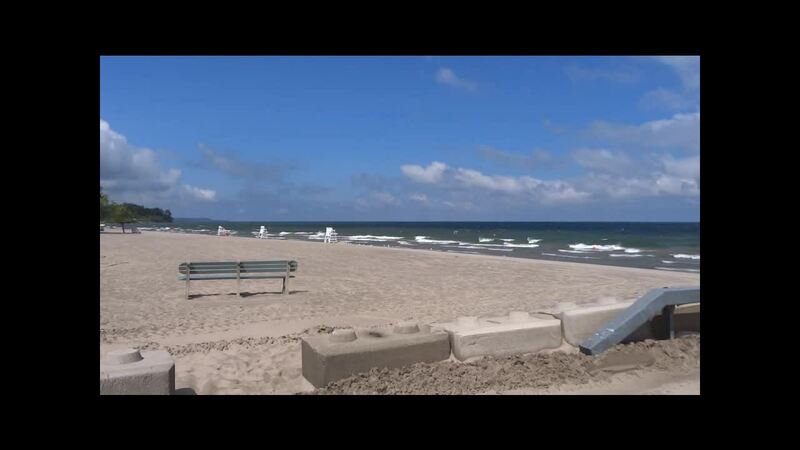 Take a trip to bloomin’ Sodus Point, and join us for a night or two at the Carriage House Inn! Sunrise signals the start of a new day, and today’s, and this one was spectacular! The orange rising sun poured its light across the shimmering waters of Lake Ontario, bathing the lighthouse in its warm glow. (Isn’t that too many adjectives??) Suffice to say it was flat out beautiful! This is also the beginning of the summer season at the Carriage House Inn, where we are getting ready to welcome back old friends and looking forward to meeting new ones. If you haven’t already, look at the calendar and and book your favorite room for your Sodus Point visit at the Carriage House Inn, where you are just a few hundred feet from sunrises like this. Speaking of calendars, be sure to check out the online calendar on our website. Click on the tab “Explore Greater Sodus” and select “Local Events” from the drop down box. Artfully designed by Cherie at TMB Studios, it’s an exciting website feature that we hope will help our guests enjoy their Carriage House Inn experience even more. At the Carriage House Inn, we feature comfortable rooms that make you feel at home, and a bountiful breakfast of savory and sweet meals that will please your palate and tickle your tummy. After a relaxing stay, however, what some guests remember the most are those wonderful chocolate chip cookies that Claudine makes several times a week. Featured in our dining room on the buffet, those cookies are available 24/7, and a plateful may not last the night. Kids (young and old!) enjoy this sweet snack that are “just like Mom used to make”. Recently the world champion crew of the 8 metre racing yacht “Gefion” claimed that the Carriage House Inn cookies powered their sailboat to victory in the North American championship regatta held recently in Sodus Point! We don’t quite believe that’s true, but the crew did put a hurting on the inventory that week! PREHEAT oven to 375° F.COMBINE flour, baking soda and salt in small bowl. Beat butter, granulated sugar, brown sugar and vanilla extract in large mixer bowl until creamy. Add eggs, one at a time, beating well after each addition. Gradually beat in flour mixture. Stir in morsels. Drop by rounded tablespoon onto ungreased baking sheets.BAKE for 9 to 11 minutes or until golden brown. Cool on baking sheets for 2 minutes; remove to wire racks to cool completely. Here’s a picture of Claudine making another wonderful batch! If you think the recipe is suspiciously like the Nestle’s Toll House Cookie recipe, you are absolutely right. We have adjusted the chocolate chips and added some motherly love…..just like Mom used to do. Think I’ll have one now! !